The Dynafit Vertical FT binding is a burly upgrade to the classic Vertical ST. It adds wider brakes, higher release values, and a torsional rigidity bar connecting the toe and heel pieces. If you want the backcountry binding proven with decades of abuse and are on the larger size or plan to go big, you'll want the FT upgrade. Please note the color varies by brake size, with the 92mm version in black and the 110m version in white. Classic rotating heel piece for changing riser heights, easily manipulated with a pole at select angles. Features adjustable release values from 6-12, and adjustable fore/aft positioning for maximum boot compatibility. Torsional bridge adds rigidity to your ski when powering through turns and sticking landings...or even not sticking landings. 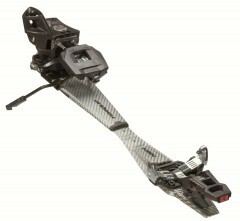 Built with high strength platsic and steel, according to Dynafits rigid specifications. Crampon compatitble with a notch just behind the toe piece (ski crampons sold separately). The FT adds rigidity and higher release values to the ST version, with values up to 12 as compared to 10. It also features wider brakes in the white version. This $100 and 10 gram upgrade will be worth it for aggressive freeriders, larger skiers, and folks with wider skis. Others may not notice the difference and would be perfectly happy on the classic STs. As mentioned in our article Dynafit Radical vs Vertical, the redesigned Radical versions of Dynafit bindings feature a Speed Step climber in the heel, Power Towers in the toe, and a shock absorber in the carbon connector plate. While riser design is a skier preference and useful side impact protection from the Power Towers is infrequent, very aggressive skiers may notice the additional shock absorbtion on big landings with the Radical FT. For most skiers, it comes down to whether you like flippy Speed Step risers or classic rotational design on the Vertical. Any idea what the toes of these binders weigh? I'm thinking of combining with a light heel piece. Hi Dillon, the toes of these bindings weigh around 205 grams each.